Today I have been focusing on a commissioned piece…so during a short break I decided to sneak in Step Seven for A Cast of Shadows. Perhaps tomorrow I shall start painting but that will depend what I am able to accomplish with the commissioned piece. Step Seven: Colour Wash. Since this painting is mostly going to be stark by having large areas of white I decided that washing the entire surface of the painting with a colour would not be wise. I decided that using white instead of a colour and only applying it lightly to areas that have graphite was the way to go. I know I have mentioned this step before but I will reiterate for those who haven’t read any of my past posts. 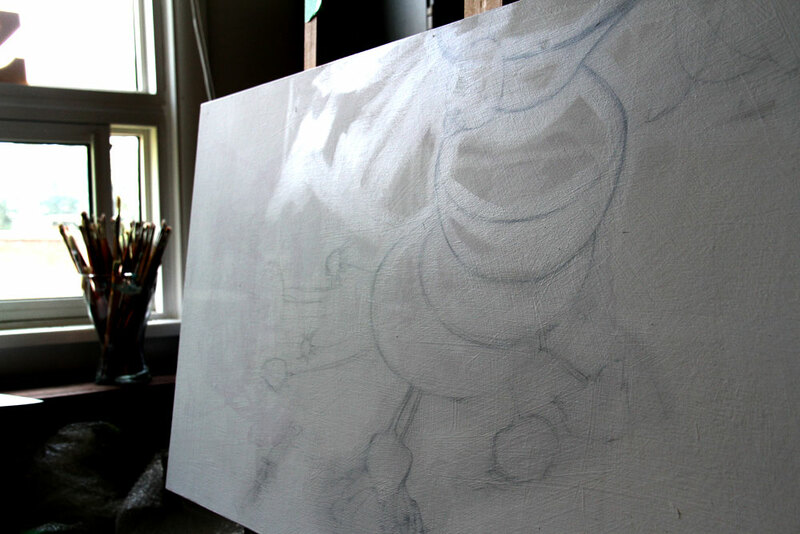 Step Seven is an essential step in my painting process. I have found from past experiences that if I start to paint over exposed areas of the transfer (the drawing), the graphite will contaminate the paint and makes it quite tedious to correct. I’m always looking for more efficient ways to paint, which save time and help eliminate extra stress! It is hard to see the ‘washed’ areas in the photo therefor I have angled the shot to show how shiny the surface is on areas that have been sealed in with acrylic. A Cast of Shadows "colour wash"
My next step is to start painting! I’m very excited about this painting because I am looking forward to capturing the shadows and adding colours to the sea of white. If all goes well today then perhaps I shall start painting tomorrow!